I’m old enough to remember the original version of “The Incredible, Edible Egg” advertising jingle, which I understand made a comeback in 2012, more than 20 years after the American Egg Board first launched the little ditty. People have probably been eating domestic eggs for close to 10,000 years, since there’s evidence that jungle fowl — from which all domestic chickens are descended — were running around farmyards in South Asia and India by about 7,500 BCE. High in protein and other goodies such as vitamin D, versatile and easy to store, the right eggs can add much to your diet. The key is getting the right eggs. But not by much, in my opinion.Would YOU rather live that way or this way? Like people, chickens do better and are healthier if they get a little sunlight every day. Not to mention that the air outside has got to smell a heck of a lot better! It’s great that the chickens get organic feed, but the vegetarian part is a problem. You see, chickens are omnivores. That means they will eat everything and anything — and should eat everything and anything for best health and to lay high-quality eggs. Bugs, seeds, grain, hay, worms and grass are the normal food of a chicken. In the wild, they will also eat carrion of all sorts. If you raise them on deep litter they will eat tiny bits of material in the litter that contains essential vitamins. If they’re anywhere near a watercourse or the sea, they will eat fish and shellfish. I’ve seen chickens kill and eat a mouse that wandered into their reach. My chickens will eat anything that comes out of the garden or kitchen except citrus peels (they’ll peck out the fruit). 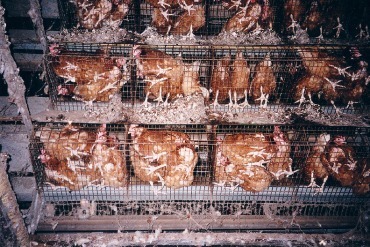 In particular, chickens need protein and fat. If you skimp on those substances, especially in the winter, your chickens won’t lay as well. So those egg producers aren’t doing their hens a favor unless they’re being really careful about matching complementary proteins for their chickens. Then there’s the difference between store-bought and home-grown eggs. 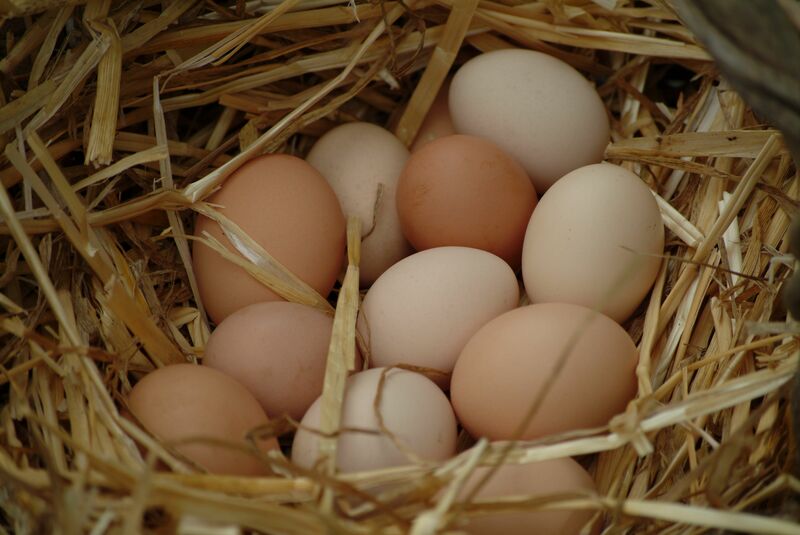 First, freshness — your eggs may be less than an hour old if you gather them before you cook breakfast. Supermarket eggs can be three months old in some states. Second, nutrition — there are studies that say organic, cage-free eggs are no different than home-grown. This always makes me laugh, because I can LOOK at a home-grown egg and see the difference: plump, deep gold yolks and thick whites. And research shows that pastured hens (green grass, bugs, sunlight) produce eggs with more vitamins and more Omega-3 fatty acids, which our bodies need. Third, cleanliness — store-bought eggs look pristine because they are cleaned. The eggs are washed with detergents and chlorine, which can be absorbed through the shell, and some commercial washers use the same soiled water over and over, depositing dirt on the eggs they are supposedly cleaning. Problem is, the cleaning removes the egg’s protective coating and allows bacteria to get into the shell. That’s one reason why store-bought eggs are much more likely to give you salmonella poisoning. The other reason is that chickens can harbor the salmonella germs inside their bodies and the germs are already inside the egg when it’s laid — washing does absolutely nothing to remove those germs. I use raw home-grown eggs in smoothies and ice cream, and let the kids taste raw cake and cookie batter with my eggs, but wouldn’t think of using store-bought eggs in that fashion. The incredible, edible egg laid by your own hens or those of a local farmer who free-ranges her chickens and feeds them a wide variety of stuff is safer and incredibly more nutritious than most commercial eggs — not to mention more edible because it tastes the way an egg should. This entry was posted in Farms, Food, Health and tagged cage free hens, chickens, cleaning eggs, commerical eggs, eggs, Omega-3 fatty acids, omnivores, pastured chickens, salmonella, vegetarian diet. Bookmark the permalink.